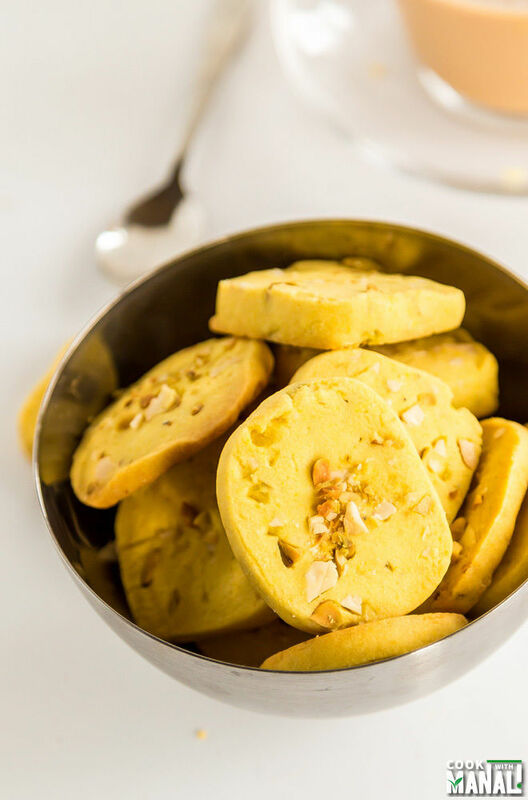 These Kaju Pista Cookies are hugely popular in India. 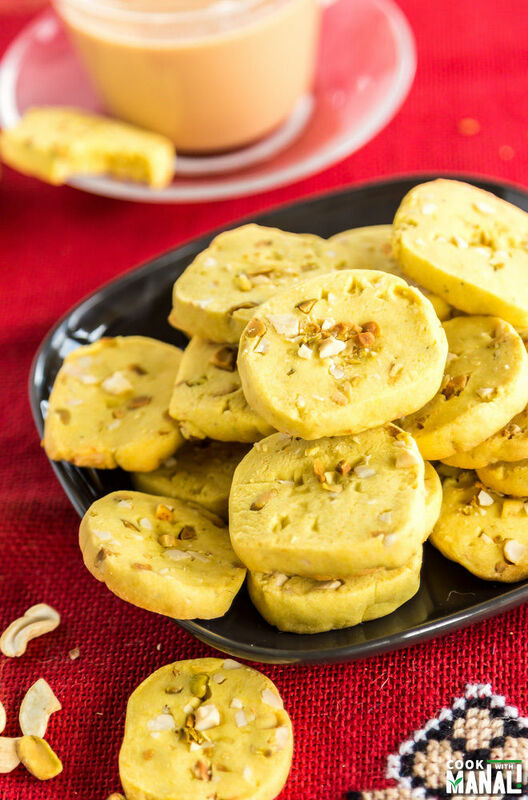 They are eggless and made with pistachios, cashews and flavored with cardamom powder. They are so good with a cup of chai and also perfect for giving as gift! I am sure everyone must be so busy with their holiday shopping right now. Doesn’t it get a little crazy during this time of the year? I actually don’t like going to malls during the holidays, first of all parking is a huge problem and even if you are lucky enough to find a spot, the lines at all the stores are huge. My biggest problem is with the line if you want to try some clothes on. Like that line in front of the trial room is huge and I really want to avoid it at all costs. Then the lines at checkouts are also huge! I think it’s a good idea to do some shopping well in advance but if you are like me [read:lazy] then obviously you will do it at the peak time, when everyone’s doing it and then get crazy with the whole madness! 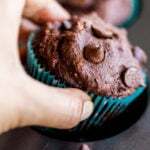 If you tired of the whole shopping madness, then I suggest you bake because baking makes everything better. Isn’t it? There’s nothing better than a dipping a crispy homemade cookie into your chai. That’s exactly how I want to start my day, everyday. 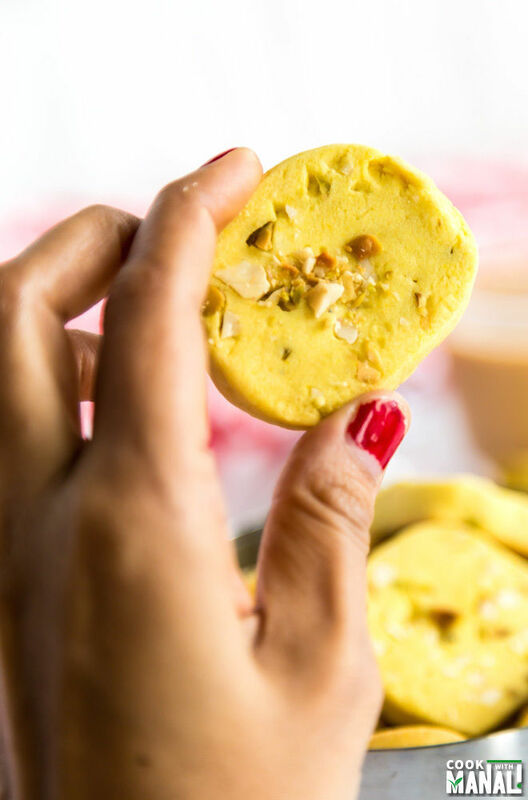 If you share my sentiments, then I have the most perfect cookie recipe for you today – these kaju pista cookies [ Kaju= cashew and Pista= pistchios in Hindi] are eggless, crispy and flavored with cardamom and kewra to make them perfect chai-time cookie. 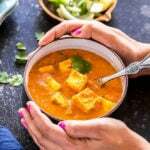 The addition of custard powder gives them a wonderful taste and aroma. Speaking of cashews, I really do love them a lot and snack on them often. These days once of the favorite things to snack on is Zone Perfect Dark Chocolate & Cashew Bars. You guys know how much I love chocolate and so these bars are like major LOVE because the combine my 2 favorites – cashews & chocolate! I need something healthy to snack on especially during the Holidays when I am baking so much and these bars are just perfect for that! Snacking on ZonePerfect Perfectly Simple nutrition bar while baking makes me #FeelGooder. These are gluten free, 200 calories or less, loaded with protein and low calorie to keep you fuller, longer. These bars come in some amazing flavors like like Bing Cherry & Almond, Oatmeal Chocolate Chunk, Roasted Cashew & Dark Chocolate and Almond Toffee Crunch. My favorite these days like I mentioned above is the Roasted Cashew & Dark Chocolate. I am such a dark chocolate fan! And the good news, you can save $1 on these bars right now! Click HERE to get the coupon! 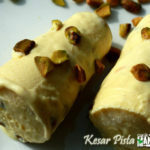 Coming back to my kaju pista cookies or cashew pistachio cookie recipe. 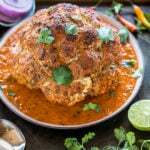 This is super simple to make, you just need to mix everything together till it forms a dough and then wrap in a cling and refrigerate for an 1-2 hours. Once the dough is chilled, cut it into pieces and bake till crisp! 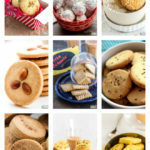 The cookies get lots of flavors from the cardamom powder, custard powder and kewra essence. I know kewra essence is not common in this part of the world but it’s so commonly used in desserts and beverages in India and South Asia. The extract is distilled from pandanus flowers and smells wonderful. If you can’t find it then you can skip it but it gives the cookies a very nice flavor. In a bowl sift together flour, custard powder and salt. Set aside. Using your stand or hand mixer, beat the butter and powdered sugar till light and fluffy, around 2-3 minutes. Add vanilla extract, kewra essence, cardamom powder and mix till well combined. Now add the flour mix and chopped nuts. Mix to form a dough. Add milk, 1 tablespoon at a time if the dough is not coming together. Divide the dough into 2 equal halves. Shape each part into a log and then wrap with a cling. Refrigerate the logs for 1-2 hours. Once the dough has chilled, slice the logs into cookies and place on a baking tray. Bake the cookies at 350 F degrees for 16-17 minutes. The cookies will continue to crisp as they cool down. * The prep time includes the chilling time for 1 hour. The actual prep time is only 10 minutes. 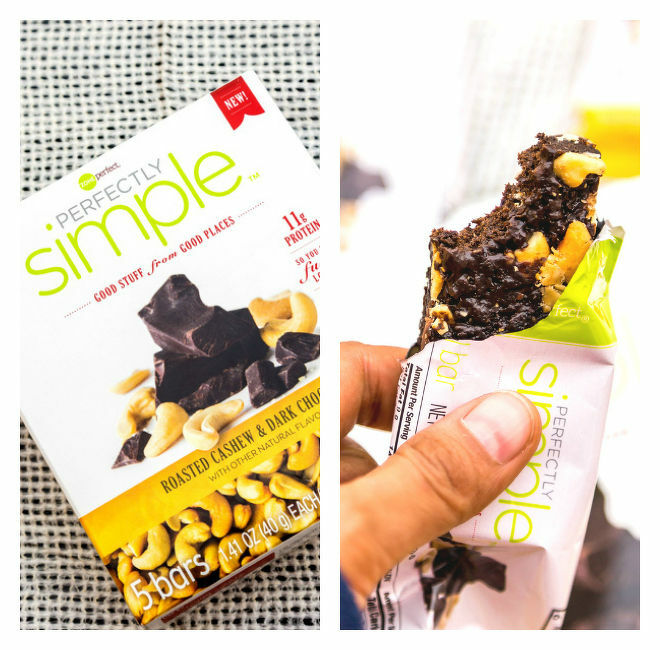 * Don’t forget to grab the $1 off coupon for ZonePerfect Simply Perfect Bars! 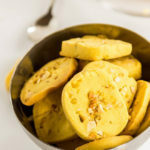 Eggless Kaju Pista Cookies are popular tea-time cookies from India! Once the dough has chilled, slice the logs into cookies and place on a baking tray. Sprinkle some more chopped cashews and pistachios on top. Bake the cookies at 350 F degrees for 16-17 minutes. The cookies will continue to crisp as they cool down. 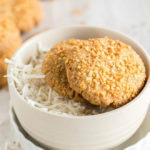 Eggless Coconut Cookies + VIDEO! 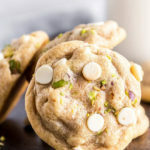 I can never decide if cashews or pistachios are my favourite nut, but now I don’t have to with these cookies. It’s great that they are eggless toO! Oh these cookies sound delicious, Manali! I love that they’re eggless and have cashews and pistachios in here. Sounds like they’re o flavorful! These cookies sound delightful! I love that they contain both pistachios and cashews! And I can’t believe that they are eggless!!! You truly are the most hardworking girl. 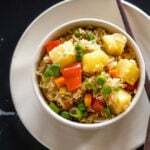 So many delicious posts up. This one captured my heart. I can never say no to nutty cookies and this has cardamom, it would be hard not to finish that whole box. Love nankhatai kind of cookies. Absolutely gorgeous. These are my favorite ones. Hi…., when I try to cut the cookies after taking the them out of the refrigerator they crumble and crack can you please tell me why this is happening ? Hmm Ritu, you might need to add little more liquid (milk) in the dough if it isn’t coming together and then try refrigerating overnight! It should work! Thanks so much ?Will try n let you know ? What can I substitute custard powder with ? I stay in France, we don’t get the same custard powder as in India.